Philip Blumel: Hi. I’m Philip Blumel. Welcome to No Uncertain Terms, the official podcast of the term limits movement for the week of April 15th, 2019. Philip Blumel: A lot of the action on term limits as of late has been on the Democratic side of the aisle. In the Chicago mayor’s race, among Democratic candidates for president, among progressive activists seeking cleaner elections. Among the crucial few undecideds left in the upcoming vote in Arizona on the term limits convention, even inside the Democratic caucus in the US House of all places. Philip Blumel: US Term Limits Executive Director, Nick Tomboulides has been keeping his eye on all these developments as always. Let’s check in. Hey Nick. Philip Blumel: All right. A little history was made this week in Chicago. 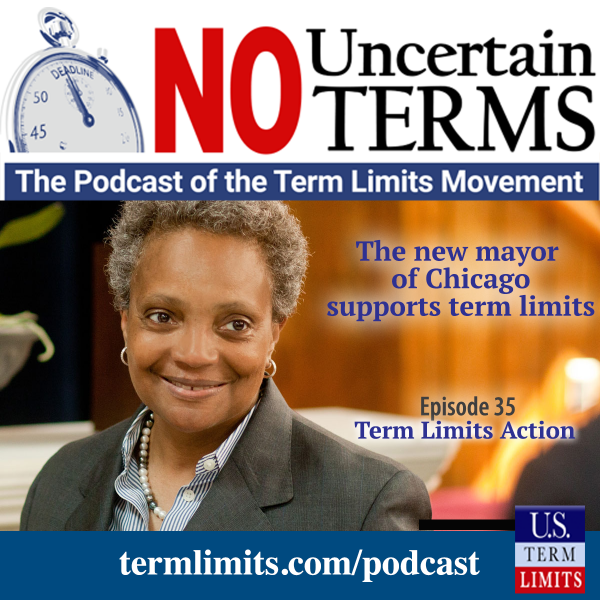 On the 2nd we had the mayoral elections and Lori Lightfoot, who is vocal supporter of two term, eight year term limits on both the council and the mayor, won the election . Nick Tomboulides: Exciting. She’s the first mayor in the history of Chicago to support a term limit on her own position. A lot of folks just assume most big cities have term limits. You’d be right. More than half the cities in America with a population over 250,000 have term limits on their mayor. Nine of the 10 largest cities in America by population have it, but Chicago is the one hold out. Nick Tomboulides: They’re the one exception that’s never had it before, and so Lightfoot put together this reform platform, which included term limits. Now that she’s in there they’ve got to put it on the ballot and get it done. Philip Blumel: Yeah. That’s fantastic. It was so exciting also because she went around talking about it, and in Illinois, unlike a lot of other places, people support term limits everywhere, but in Illinois it’s really a hot issue, and the press asks both candidates running for basically all these positions, mayor, state legislator, governor, what they feel about term limits, and she really made it part of her campaign, and she ended up winning with a much larger margin than what was expected. Nick Tomboulides: Yeah. And Chicago obviously no stranger to corruption. They’ve had a tremendous number of city council members who’ve been indicted or convicted just in the last several decades. I think more than 30 of the Chicago city council members have been connected with corruption. The most high profile one was Edward Burke, longest serving council member I think in the history of Chicago. Longest serving alderman. He had been there, what, about 50 years I think, right, and he was caught on an FBI wire tap trying to extort legal work. Trying to extort campaign donations from people who are running businesses in the city. Nick Tomboulides: And the hilarious part is this really shows up the culture of corruption in Chicago. His fellow city council members were not angry about his corruption. They were angry that he got caught. Nick Tomboulides: What really outraged them when they were all asked in the aftermath what upset you the most about this they said well, we didn’t like the fact that he was getting secretly recorded taking bribes. Philip Blumel: Right, right. How dare they? That’s so rude to record us when we’re trying to engage in some little bit of business here. Philip Blumel: Oh boy. That’s right. The Lori Lightfoot’s opponent, Toni Preckwinkle, opposed the term limits, and her exact quote, and I am not making this up, her exact quote was we already have term limits. They’re called elections. Nick Tomboulides: You know my favorite quote is we have term limits. They’re called indictments. Nick Tomboulides: Look, if Chicago wants us to stop doubting politicians they have to stop giving us reasons to doubt the politicians. Nick Tomboulides: Scandal after scandal has just drained the citizens there of any faith in their elected officials. It’s really more of a mafia style pay to play system. You’ve had several of the last few governors of Illinois go to prison. Rod Blagojevich, the most recent one for trying to sell a senate seat. The culture just really needs to change. Nick Tomboulides: I think Lightfoot sounds like she’s a breath of fresh air. It’s not just term limits that she ran on. She had a whole anti corruption platform. Philip Blumel: That’s right. She did. Nick Tomboulides: Term limits was really right at the top of that. She wanted to get rid of conflict of interest. She wanted to get rid of gerrymandering and investigate ethics abuses. So it’s a new day for Chicago, and definitely a step in the right direction. Philip Blumel: Yep. All right. Well, other news that affects Democrats because Lori Lightfoot naturally is a Democrat winning the mayor of Chicago, but several of the Democratic candidates over the last week or so for president that is spoke out on the issue of term limits, often sparked by activists or even staffers of US Term Limits, and the first of those that I noticed as Representative John Delaney of Maryland, who is a six year … Was a six year. I guess he’s not there anymore, representative in the US House, and he was asked by our own Ken Quinn in New Hampshire while John Delaney was basically on the stump looking for supporters in his presidential run whether he supported term limits, and he said absolutely. I’m very supportive of that idea. Philip Blumel: And in fact he has stated that before. He has a book that also mentions the idea. So John Delaney firmly in the pro term limits camp amongst the Democratic presidential candidates. Nick Tomboulides: Yeah. No one can sleep on this guy even if you’ve never heard of him before you probably will hear of him soon. He recently retired from Congress after three terms, and he retired as one of the richest members of Congress. I think his net worth is reportedly over 200 million dollars. Nick Tomboulides: He definitely has the deep pockets to fund a national president campaign, and I expect that he’s going to be in the discussion as one of the prominent candidates sooner rather than later. Philip Blumel: It probably should be pointed out that he was really rich before he got to Congress. It wasn’t because of his six years in Congress. I probably should make that distinction. Nick Tomboulides: You can’t really get rich in six years in Congress. Philip Blumel: It takes longer. Nick Tomboulides: That’s the whole point of term limits. That’s why we’re against career politicians. Scott Tillman: Hi, this is Scott Tillman, National Field Director with US Term Limits. I want to let you know about some upcoming events where you can connect with us to discuss term limits. June 28th through 30th in Memphis, Tennessee at the Young Americans for Liberty conference. July 11th through 13th at the Net Roots Conference in Philadelphia, Pennsylvania. July 11th through 13th at the Western Conservative Summit in Denver, Colorado. July 19th through 21st in San Jose, California at the Young Americans for Liberty Conference. July 17th through 20th at Freedom Fest in Las Vegas, Nevada. Scott Tillman: There are many events happening around the country. If you know an event where US Term Limits should be please contact us with the details. Philip Blumel: Who else, somebody else came out for term limits, against term limits this week? Nick Tomboulides: Well, Bernie Sanders. Nick Tomboulides: One of our volunteers went to a Bernie Sanders event in Muscatine, Iowa, and had success not only asking where he stood on term limits, but we also got this written up in the Washington Examiner. I know this is going to be shocking to our podcast audience, but Bernie Sanders, the 30 year Washington veteran is not a supporter of term limits. Nick Tomboulides: Bernie actually called term limits undemocratic. Philip Blumel: Oh, come on. Nick Tomboulides: Look folks, I’m against term limits. Term limits are a conspiracy of the one percent. What we really need is bread limits. Philip Blumel: Right. What’s ironic about that is most term limits that are imposed across the United States aren’t done by the politicians. It’s done by people that collect signatures, put it on the ballot, and then have other citizens vote for that measure overwhelmingly, usually with numbers as high as 70 or 80 percent, and he’s calling it undemocratic. That’s pretty clever. Nick Tomboulides: Look, the existence of a Senator Bernie Sanders is pretty undemocratic. We let him vote on the laws of our nation. We don’t vote on those directly ourselves. Philip Blumel: That’s a good point. Nick Tomboulides: We don’t have a direct democracy in this country. We have a democratic republic, and in order to make that work, in order to make our elections function properly, we need to draw the right parameters around elected office. Nick Tomboulides: So for example, you can’t run for Bernie Sanders senate seat if you live in California. Nick Tomboulides: You can’t run for Bernie Sanders’s senate seat if you’re 19 years old. There are rules and regulations around political office in order to keep the system clean, and 90 percent of the time Bernie Sanders is not against those rules and regulations. Philip Blumel: Oh no. Of course not. Nick Tomboulides: In fact if you look up rules and regulations in the dictionary you see a picture of Bernie Sanders. So he just has this kind of glaring exemption to his philosophy. Nick Tomboulides: I think it comes from a place of self interest. He doesn’t want to admit that he is someone who would probably make a good poster child for term limits. Philip Blumel: Of course it’s from self interest, and of course even taking the idea of democracy further, what policy leads to more open seats and competitive elections, term limits. What opens up more chances for citizens to run and win public office, term limits. What gives citizens more opportunity to work on campaigns that have a chance to win and therefore be more meaningful, term limits. Philip Blumel: It’s such a clearly prodemocratic policy, reform, for the people versus that one percent that he’s worried about, which he is of course part of in this case. So Bernie, sorry buddy. Nick Tomboulides: I actually went to a conference a few weeks ago in Nashville called the Unrig the System Summit, and it was a progressive leaning conference to discuss election reform in the United States. How to crack down on corruption. How to crack down on bribery. Obviously most people there believe term limits has to be a piece of the puzzle, but what fascinated me was that this movement of progressives who seek to defeat the rigged system in Washington, it’s led primarily by younger, very energetic voices. People who tend to be in their 20s, 30s, maybe early 40s, who just very wide eyed. Nick Tomboulides: Very kind of idealistic and believe that we can overcome this corruption, but the question is how are these people ever going to get into positions of leaderships if they’re being blocked by these prehistoric incumbents who have clung to power for decades on end. There’s just no opening right now because there’s no term limits. Nick Tomboulides: What I see is a natural synergy developing between these young people who would like to have more influence on the process, and the term limits movement which would bring down the barriers to entry and create those opportunities for them. Philip Blumel: Right. We saw some action on this front, and for those exact same reasons, within the Democratic caucus in the House. As you recall when Pelosi was trying to regain her position as Speaker she made a deal with a bunch of people in the House, again, mostly the younger new members of the House that felt very strongly about this issue that she said that she would allow a vote to change the rules, the caucus rules, to put term limits on the three major positions in the Democratic caucus. That would be the House Speaker, the Majority Leader, and what’s the third, the Whip. Philip Blumel: So there was a meeting that was supposed to be held on March 15th, but it was postponed. There was a government shutdown and whatever going on at the time I guess, but now they just had a meeting on April 1st, this is not a joke, late night meeting. Pelosi was I believe there in which they went over this issue, and they went a lot back and forth, and it looks like a lot of the steam has gone out of this effort now that Pelosi is established in that position, and so I don’t know that this is going to be something that happens, but it was really encouraging to see this little short lived, I don’t know what you want to call it, little tussle within the Democratic party on this issue. Nick Tomboulides: And yeah, it’s rare that you ever seen anyone in Congress standing up to the leadership. Mostly, the way the game is played is you keep your head down for 10, 12 years. You get your committee assignments. You have to kiss the rings before you could have any influence in Washington, DC. It’s unusual that a group of newer members would actually confront leadership and ask for more of an opportunity early on. We’ll monitor it. We’ll see where it goes. If it’s a broken promise it wouldn’t be the first one in Washington, DC, and no one would be surprised, but yeah, it’s definitely worth keeping an eye on. Philip Blumel: This week we ran across a fun term limits quote from Barack Obama from back in 2012 when the president was speaking to supporters announcing his intention to run for reelection, but as we shared in previous podcasts, President Obama wasn’t just kidding around about term limits. He was a supporter, a genuine supporter for term limits for both the Congress and the president. Philip Blumel: Speaking to the African Union in Ethiopia in 2015 President Obama called for African leaders to respect their constitutional term limits and promise that their nations would benefit. Let’s hear both clips. President Obama: When a leader tries to change the rules in the middle of the game just to stay in office it risks instability and strife as we’ve seen in Brunei, and this is often just a first step down a perilous path, and sometimes you’ll hear a leader say I’m the only person who can hold this nation together. If that’s true then that leader has failed to truly build their nation. President Obama: You look at Nelson Mandela. Like George Washington, forged a lasting legacy not only because of what they did in office, but because they were willing to leave office and transfer power peacefully, and just as the African Union has condemned coups and illegitimate transfers of power, the AU’s authority and strong voice can also help the people of Africa ensure that their leaders abide by term limits and their constitutions. Nobody should be president for life. President Obama: And your country’s better off if you have new blood and new ideas. I’m still a pretty young man. I’m still a pretty young man, but I know that somebody with new energy and new insights will be good for my country. President Obama: I was thinking as I was about to come out about this, which will be my last campaign. No, no, there’s a term limit thing in the presidency. This isn’t like Congress. I can’t just keep on running. Philip Blumel: Well, let’s look at the states that are still alive for this session. We’ve been talking about we won the Georgia senate earlier in this session, and we were waiting on a House vote, but we were being held up by the Speaker. So how did that turn out, Nick? Nick Tomboulides: We didn’t get the House vote. Nick Tomboulides: That doesn’t mean we were defeated. Nick Tomboulides: If we actually had a vote and we lost the vote that would be one thing, but in this case we did not get the vote. It’s a part-time legislature with a very short session, and it’s a two year session. So this session that started in 2019 carries over to 2020. Nick Tomboulides: And in 2020 we will have the opportunity to pass the state house. I know it’s not the result that our activists from Georgia were looking for, but we are very much still alive in Georgia, and we get to carry our senate passage over to the 2020 session. Philip Blumel: Right. So in the 2020 session we don’t have to pass the senate again. We’ve already won it so now we only have to worry about the other house. Georgia was a victory for the 2019 sessions for sure. Nick Tomboulides: Absolutely. We can put our focus on winning the House. We can send our grassroots organizers. We can send our canvassers into House districts, get more members on the pledge. 2020 is an election year so I think the incentive is even greater to do this. To try to placate the voters. A lot of Democrats in the State House in Georgia are wondering why the Republican speaker is not giving it a vote. So they might in between a rock and a hard place. Philip Blumel: Right, okay. And we were also talking about, been talking about Arizona. There we passed the House, and we’re waiting on a Senate vote. Nick Tomboulides: We are waiting on a Senate vote. We are going to get the Senate vote in April in Arizona. Nick Tomboulides: The session ends on the 27th. We could see the vote as early as next week. What’s really hanging in the balance in Arizona are three Democratic state senators who signed the US Term Limits pledge. They said absolutely. I’m for this. I’ll co-sponsor congressional term limits, and I’ll vote for it, but they have since gotten deluged with this wave of pressure from lobbyists and special interests to break their word and go against us. Nick Tomboulides: So there’s epic … There’s an epic cosmic struggle going on in Arizona and in the minds of these three Democrats as to whether they listen to the people of their districts who want term limits, or whether they listen to the swamp, and we are doing everything in our power to alert the voters in Arizona of this dilemma the representatives are facing asking them to reach out and encourage them to vote for it. Philip Blumel: Okay. So now unlike Georgia, though, this vote is going to determine whether or not we live or die in Arizona this year. So if we lose this vote we’re done in Arizona. We’d have to start all over again next year. So that’s how important this one is. Nick Tomboulides: We’re not there yet. It comes down to these three Democratic senators, Sean Bowie, Andrea Dalessandro, and Jamicita Peshlaki. Those are the three. Philip Blumel: What should our listeners be doing? Is there anything they can be doing to help out in Arizona? Nick Tomboulides: Termlimits.com current actions tab. We’ve got an action there where you can blast an e-mail there directly to these senators, and I think it also goes to the other senators in Arizona just to let them know how important this is to you, if you live in Arizona go ahead and take that action. Philip Blumel: Right. If you don’t live in Arizona don’t. Nick Tomboulides: We don’t want people from outside the state to do this because that just pisses them out. They need to hear from constituents. They need to hear from people they know. So if you live in Arizona that’s the best way to do it. Philip Blumel: All right. We’ll finish off with another victory in Florida. Another week, another committee. Nick Tomboulides: Yeah. It’s like there’s no end to the number of committees that we have to face in Florida. This is the Senate Education Committee, and we were a little worried about this one because on the eve of the committee hearing one of the most powerful lobbyists in the State of Florida came up to our team, and he said you guys better bring a life vest to this committee tomorrow. You’re on life support. You don’t have the votes. Nick Tomboulides: So we just kind of shrugged it off. Brushed off our shoulders. Came in the next day. Same lobbyist comes up to us before the committee hearing and said you guys are dead. You better get this thing postponed because you are dead. I’ve counted the votes. You do not have the votes on this committee. Mark my words. Philip Blumel: Oh boy. You must have been sweating. Nick Tomboulides: I just looked at him. I was pretty calm and collected, and I said hey man, pride comes before the fall. I left it at that. I left it at that. Philip Blumel: No, it’s good. Nick Tomboulides: We just kind of kept our heads down. We stayed humble. We entered our testimony into the record. We up our state senators, and would you believe it, we passed the committee five to three, and that guy, that lobbyist, had to scurry out of there doing the walk of shame with his tail between his legs. Nick Tomboulides: It was a great moment. So school board term limits are very much alive in Florida. One more committee stop in the senate, that’s Senate Rules, and then we would go to the floor in both chambers. Philip Blumel: That’s great. I heard a podcast interview that you did on the subject of school board term limits recently. It was great work on that. Jeff Solicheck: Welcome to the Grade Book, a Tampa Bay Times podcast on Florida education issues. I’m reporter Jeff Solicheck. Today is April 11th. Yesterday in the Senate Education Committee a bill moved forward that would allow for a statewide vote on creation of term limits for school board members. If this were to move forward voters would decide whether to require all school board members to leave their office after two four year terms. Take a break. They could come back again if they wanted to afterwards, run for reelection at that point, but they would need to leave after eight years. Jeff Solicheck: Today we have Nick Tomboulides of US Term Limits, which is pushing for this measure. I want to start off first by just asking why would the US Term Limits movement focus on Florida school board members at this point? What is the attraction that? Nick Tomboulides: So we actually work on term limits all over the country at every level of government from Congress all the way down to dog catcher, and right now we actually have a movement underway to term limit Congress using the power of state legislatures. So it’s not that we’re entirely focused on school boards in Florida. It’s just that this is an issue that’s very near and dear to our heart because most of the US Term Limits team actually lives in Florida, and we want government here in Florida to be more accountable, more transparent. We want more competitive elections. Nick Tomboulides: So there seems to be a great opportunity for this based on what happened at the constitutional revision commission last year. It was kind of unfortunate what happened because the courts decided that Amendment 8 was not constitutional, but they were only focused on the school choice element of the amendment from last year. They didn’t actually have any commentary on the eight year term limits portion for school boards. Nick Tomboulides: That kind of got caught in the crossfire in a way, and we think the people of Florida actually deserve a chance to vote on that. We think the legislature should make things right and put it back on the ballot because 82 percent of voters want it. Jeff Solicheck: Is there any part of the argument that is not favorable towards term limits that you actually makes sense at all, or is that just a complete nonstarter? Nothing good there? Nick Tomboulides: Oh, yeah, definitely. There are some good public servants who serve a long time. Whether it’s Congress, school boards, whatever. They’re not all bad. Now, I happen to think that the really good ones are kind of a minority, and I think most people would agree with that, but it is true that with term limits you do lose a few really good people. That’s not arguable, but most of those good guys actually happen to support this anyway because they would rather overhaul the entire system, make our elections more fair, bring down the barriers. Give people more opportunities than just personally have the ability to stick around for a very long time. Nick Tomboulides: What’s cool about this bill, HJR229, SJR274 is it’s a consecutive term limit. So if there are people who have made a real difference at the local level, they would have the opportunity to sit out and come back. Meaning that some of that institutional knowledge would be retained. If the voters really wanted them back they could bring them back. Jeff Solicheck: Well, again, thanks Nick for taking sometime to talk with me, and I hope we get a chance to talk again soon. To keep up with the latest on Florida education breaking news please visit the Grade Book Blog www.tampabay.com/gradebook. Philip Blumel: Thanks for joining us. That’s it for this week. Hopefully you’re already a subscriber. If not please do. You can use ITunes, Google Play, Stitcher. There’s no better way to plug in to the growing term limits network, and please help us grow. This week please send an e-mail to at least one friend, family member, associate co-worker who might be interested in the issue of term limits. Tell them that you’re active in this movement and to ask them to join you. Send them the link to www.termlimits.com, and ask them specifically to one, sign the online petition, and two, listen to the podcast. At least one person. Think about it, you know just the one. Actually, you probably know more than one. Then come back next week for another episode of No Uncertain Terms. See you then.